Maytag dishwashers are generally very dependable and are heavily relied upon by thousands of our customers in Meridian. Because of this we feel it is important to share some repair avoidance tips to our dishwasher users. 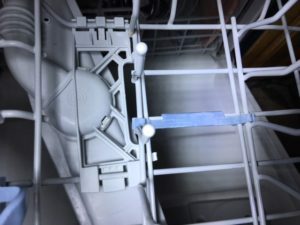 The picture below shows a top-view shot of the upper spray arm of a Maytag dishwasher. If you look carefully you will see a small blue clip attached to the splines. This little piece can wreak havoc on the chopper blade of the dishwasher motor if it becomes loose and falls into the circulating water. Periodically it is wise to visually scan the inside is the tub for broken pieces of debris or plastic before starting a cycle.